Free pair of 6-Inch stainless steel clamps. Dimension: Duct Length: 25 feet; Duct Diameter: 6 inch. Ducting Material: High-quality aluminum (High Temperature Resistant & Corrosion Resistant & Long Lasting); Clamps Material: Stainless steel (Rustproof & Corrosion Resistant & Heavy Duty). Ducting Feature 1: Three-layer Thickness (Aluminum Foil + PET + Aluminum Foil): Flame-retardant coating. Thermal Endurance: Temperature range from -22 to 266 Fahrenheit. 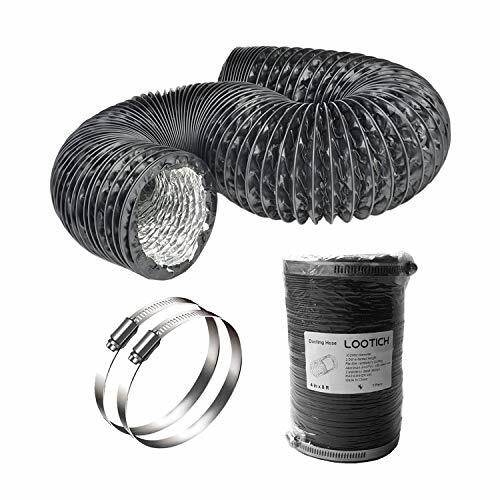 Ducting Feature 2: Built-in steel wire for reinforcement and long lasting performance. 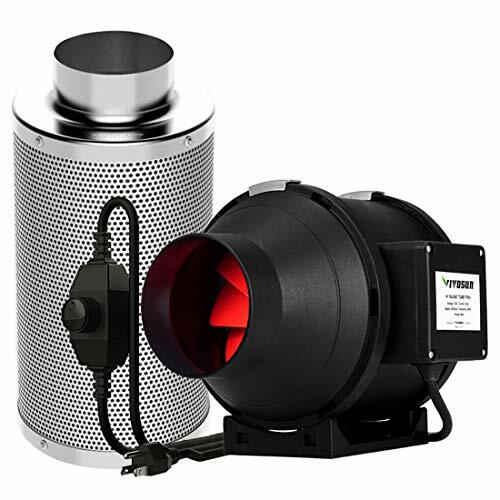 Ducting Feature 3: Flexible length for exhaust fan blower / inline fan; quick and easy to set up. Application Scenarios: Perfect for Heating Ventilation & Air Conditioning (HVAC), Kitchens, Bathrooms, Greenhouses, Grow Rooms, Grow Tents, etc. 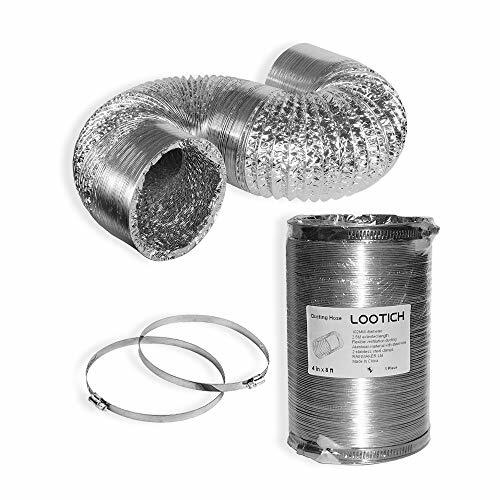 LOOTICH Ventilation Ducting is made from high quality aluminum foils to provide flexibility and protect against breaking during installation. Not only does the duct act as in intake and exhaust piping for active-cooled fixtures and reflectors, but also stores and dissipates heat at a steady rate, which reduces room temperature fluctuations. >This 4-inch ducting fits any standard 4-inch inline fan. >3-layer thickness: Aluminum Foil + PET + Aluminum Foil. >Helically shaped and internally crimped galvanized steel strip. >Interlocking steel strips to form an air tight and leak proof system. >Each ducting unit includes a pair of metal clamps made from stainless steel. >This air duct is easy to cut using a pair of metal snips or a standard wire cutter. >This ducting is easy to bend to install in hard to reach spaces such as grow rooms, attics, crawl spaces, etc. >This ducting is made with aluminum reinforced with a spiral-wire, designed to prevent the ducting from unraveling when cut into smaller pieces. >Typical applications for ventilation ducting include: dryer room vents, A/C or Heater ducting, grow room ventilation and other indoor gardening applications. Free pair of 4-Inch stainless steel clamps. Dimension: Duct Length: 25 feet; Duct Diameter: 4 inch. Product Description This ducting was designed for various ventilation, circulation, and heating/cooling transfer applications. It features four-layer protection, making it more durable and resistant to leaks than single-layer designs. The internal layer is a heavy-duty dual aluminum foil that is fire/flame resistant. While the outer layer is made of dual PVC thermoplastic that protects the aluminum from cuts and tears, while stopping leakage. The ducting are held together by an internal steel-wire spiral that is flexible and easy-to-install in hard to reach places. The ducting can be shorted but cutting the tube, to fit various applications. Includes two stainless steel duct clamps. Applications Used in conjunction with a duct fan system for various air circulation and ventilation projects including hydroponic grow rooms and tents, exhausting bathrooms and attics, transporting heating and cooling, and other installations. It is also used in the cooling of AV equipment rooms, closets, racks, and cabinets. Four layer design makes it more durable and resistant to leaks, tears, and cuts. Constructed of Aluminum and thermoplastic, tube can be shortened for various applications. FREE PRE-FILTER INCLEDED: We recommend replace the pre-filter every 6 months or after completion of each grow cycle. POWERFUL AIR FLOW: Heavy hitting blower with a fan speed of 2500 RPM for an air flow of 203 CFM. Moves air through your target location efficiently for optimal ventilation. 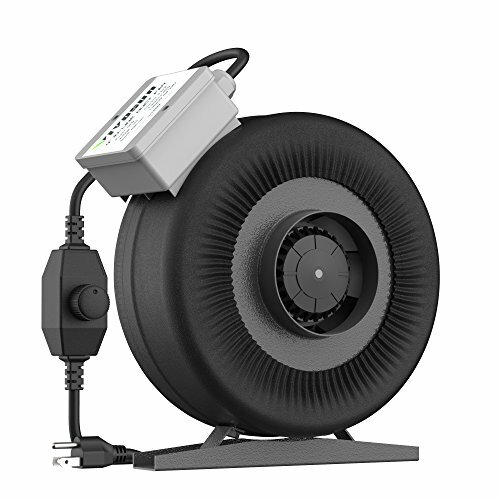 RUNS SMOOTH AND QUIET: Powerful fan puts out only 49 dB noise level. Fine-tuned for minimum vibration with a sturdy vegan leather cover that further muffles any sound or vibration. >4 LAYER thickness: PVC + Aluminum Foil + PET + Aluminum Foil. >This duct hose can withstand hot temperatures up to 180 F (-18 ~ 85 ). 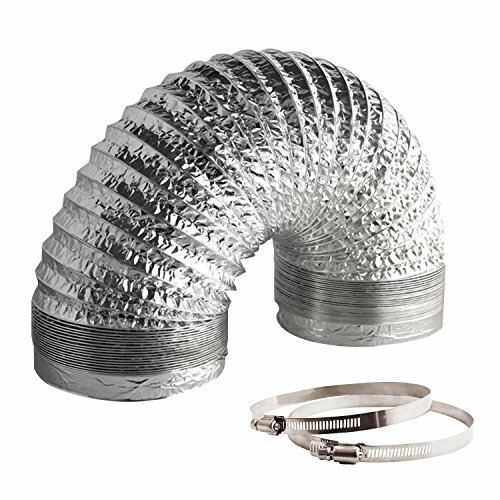 What are the recommended uses for this flexible duct? 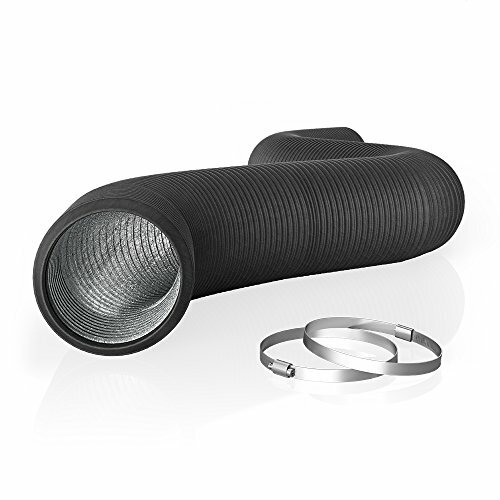 This duct is designed for applications such as kitchen vent hoods, dryer room, Heater ducting, HVAC air lines, indoor gardens, grow tents and bathroom exhausts. Can this duct be used as a portable AC Hose? Not a good choice for portable AC applications. It will accumulate and dissipate heat exhausted by AC and keep it from coming out of the window. We recommend using a plastic duct for AC exhaust purposes, plastic will not accumulate or dissipate heat until it reaches the window exhaust. Can this duct be used as a portable vacuum/leaf sucker hose? No, this duct is made with Double layer of foil and a Black PVC plastic layer and is designed to transfer air. Debris transferred by vacuum will puncture the flexible ducts. Application Scenarios: Our Ducting is suitable for any Heating Ventilation & Air Conditioning (HVAC), Kitchens, Dryer Rooms, Bathrooms (Smell and Moisture Exhaust), Greenhouses, Grow Rooms and Tents, etc.